DecrptOr Ransomware is a new testing malware that can be eliminated by reading our in-depth removal guide. How Does DecrptOr Ransomware Infiltrate the System? 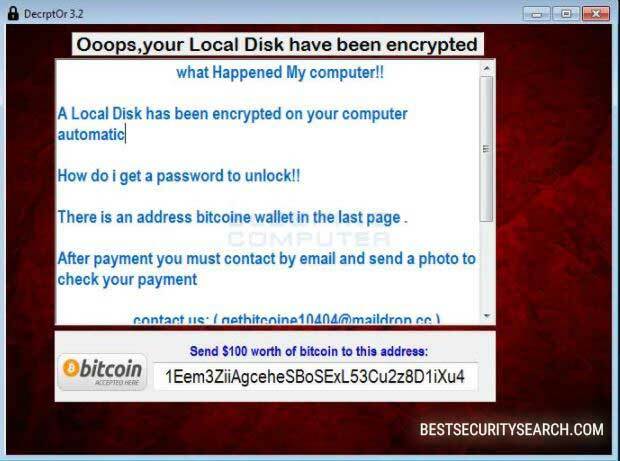 An infection with the DecrptOr ransomware can be triggered by falling victim to one of the distribution strategies devised by the virus operators. One such way is the interaction with infected email messages. Most of them use social engineering tricks that confuse the targets into opening up the file attachments or visiting malicious links that lead to a DecrptOr ransomware infecton. This is done by using template messages that imiitate well-known institutions or companies. Payload agents can also be infected documents or software installers. When the users interact with them built-in scripts are triggered that cause the DecrptOr virus infection. They are usually found on hacker-controlled download sites or P2P networks. Browser hijackers and direct hacker attacks are other options that are used by the hackers to deliver the DecrptOr ransomware. The DecrptOr ransomware is a newly discovered computer virus that appears to be in an early stage of development. The initial security analysis made by the researchers indicate that it does not contain any code from the famous malware families, making it an original development of its creators. At the moment it is not known who is responsible for its development, whether it is an individual or a criminal collective. Only an encryption engine is bundled in the captured DecrptOr ransomware malware samples. It seeks to processs system and user data based on a predefined list of target file type extensions. The current iteration of the DecrptOr ransomware does not seem to encrypt the files or process them in any way. However it is very likely that future versions may use complex ciphers and a ransom extension to mark the data. How do i get a password to unlock!! There is an address bitcoins wallaet in the last page. As we can see from the note the criminal operators of the DecrptOr Ransomware extort the victims for a payment of 100 US dollars in the Bitcoin digital currency. WARNING! Manual removal of DecrptOr Ransomware requires being familiar with system files and registries. Removing important data accidentally can lead to permanent system damage. If you don’t feel comfortable with manual instructions, download a powerful anti-malware tool that will scan your system for malware and clean it safely for you. WARNING! All files and objects associated with DecrptOr Ransomware should be removed from the infected PC before any data recovery attempts. Otherwise the virus may encrypt restored files. Furthermore, a backup of all encrypted files stored on external media is highly recommendable.